FRANK & POLLACK LLC is a full-service Immigration law firm, handling all types of Immigration and Immigration-related legal issues, including but not limited to: I-9 and Worksite Enforcement Compliance, Business Immigration Visas and Overseas Transfers, EB-5 and Investor Visas, Extraordinary Ability Aliens Petitions, Unlawful Presence Waivers, DACA, Deportation Defense, Family Visas, Citizenship & Naturalization, Student Visa Issues, Changes in Status, and Labor Certification and Employment-based Visas. We also handle cases for Asylum, Temporary Protected Status and various Waiver cases. 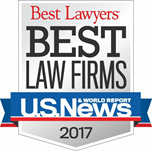 The Firm was recently acknowledged as “BEST LAWYERS AND LAW FIRM 2017“, by U.S. News & World Report for Immigration in New Jersey; the third straight year they have earned this honor. Based in Newark, New Jersey, the firm handles cases from all over the country and even from overseas. The two partners of the firm boast in excess of 60 years of combined Immigration practice experience. Frank & Pollack LLC is also AV Rated and listed in the Bar Register of Preeminent Law Firms, ranking us among the very best Immigration Law firms in the country. We pride ourselves on handling the toughest of Immigration cases, and also in providing you with excellent referrals to our cadre of colleagues in the areas of Family Law/Divorce, Personal Injury, Workers Compensation, Bankruptcy and Criminal Law. We also provide advice and expert opinions on the Immigration consequences of potential criminal convictions; often working with criminal law attorneys to make sure our clients get the best plea agreements or results in their criminal cases, to prevent the consequence of deportation thereafter. The New Jersey immigration attorneys at Frank & Pollack take pride in the fact that they have an extensive record of publications and public speaking engagements in the area of Immigration law and are regular speakers at both state and national educational conferences on Immigration law. We keep up to date on the very latest developments and changes in Immigration law and practice. If you are unsure where you stand with your Immigration case, you should call to schedule an appointment with one of our partners. We can even accommodate consultations by phone and email for our long-distance clientele.